Yesterday I took a long 80 mile cycle. Initially I headed West from Colinton in Edinburgh through to Airdrie. In Airdrie I lost track of the sign posts for the National Cycle Route 75. So I headed North to the Forth and Clyde Canal to Falkirk. At Falkirk I joined the Union canal home. There was only 2 hilly sections of the route. There is a steady climb from Colinton to Balerno. Though from Balerno towards Kirknewton there is a steep downhill. Heading from Airdrie to the Forth and Clyde Canal there were quire a few hills that I went over. Along the Bathgate to Airdrie section there is a series of large artworks along the path. At Falkirk the sun was setting behind the Falkirk Wheel as I was passing. I was surprised that I didn’t get another puncture going through Livingston or on the Airdrie side of the Bathgate to Airdrie Cycle Path, with the amount of broken glass lying around. The longest cycled in one day was about 70 miles to Berwick Upon-Tweed. So yesterday set a new record. Not much more now until I cycle 100 miles in one day. This entry was posted in Cycling, Maps, Union Canal on April 2, 2007 by smsm1986. Today was the first time that I cycled along the Union Canal from the canal basin near Tollcross in Edinburgh to Wester Hailes in the West of the City. The surface was very smooth and without the potholes that were there before. In many places, the path is wider than what it was before. The nice weather has also got people out, as the canal towpath was fairly busy, compared to what I have seen it before. This entry was posted in Cycling, Edinburgh, Union Canal on March 24, 2007 by smsm1986. On Sunday afternoon, there was some strong Westerly winds, so rather than cycling into the wind, I decided to cycle with the wind. Rather than do my usual of cycle somewhere, and then take the train home if it isn’t a circular route, or I’m too tired; I took the train out to Dunblane and started cycling from there. It took about an hour to get from Edinburgh Park to Dunblane. The train diverted via Falkirk High instead of Falkirk Grahamson and missing out Camelon due to some essential rail maintenance. After Falkirk High the train stopped to turn around and head in the other direction so that it could go north towards Dunblane. The cost was £4.10. On getting off the train at Dunblane, I looked North and though “oh no, the heavens are about to open”. The sky was very dark with very heavy and dark cloud. I set on my way hoping that I wouldn’t get totally soaked. Heading down into Bridge of Allan, there was a little flurry of snow. There wasn’t enough for it to lie on the ground. After Bridge of Allan, I headed through Stirling, Tullibody, Alloa to Kincardine on the North Side of the River Forth. Due to the high winds the Forth Road Bridge was closed, so I headed South over the Kincardine Bridge to Grangemouth. There I headed into a head wind into Falkirk. At Falkirk I joined the Union Canal beside Falkirk High Station. I now know how Falkirk High got its name. 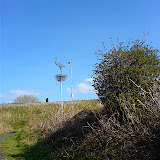 It sits at the top of a hill on the south side of Falkirk. I probably would have been faster keeping to the road, though the canal towpath is much simpler since you are unlikely to take a wrong turn. The total distance that I cycled was about 54 miles. It took me about 5 hours and 40 minutes in total, with a couple of breaks. This entry was posted in Cycling, Union Canal on March 21, 2007 by smsm1986. A week past Wednesday, I took a cycle straight from university along the Union canal to Falkirk. It was the furthest West I have cycled along the canal towpath. It was an enjoyable quiet cycle that too just over 4 hours. I needed the exercise. I even got around to taking a few of pictures on the way. The two photos attached to this post were taken only a few minutes apart, a short distance apart. I’ve now seen the Falkirk Wheel, for the first time. As it was very dark by then the pictures of it didn’t come out well. After getting into Falkirk around 8pm, I popped into Tesco for a quick shop, before hopping on the train with my bike home. The next day I had some horrible slow puncture that got rapidly worse that meant I had to push the bike home. It was a lovely thorn that was stuck in the tyre that caused the puncture. Pushing the thorn out and patching the inner tube seems to have fixed it. The hardest part of the repair was tyre back on to the wheel, but I managed. Yesterday I managed to get another puncture, this time on the other tyre. It was caused by a bit of glass 8mm long and about 2-4mm wide. It caused so much damage to the inner tube that meant that patching it just didn’t work. So after a couple of failed attempts I stuck in a new inner tube. This entry was posted in Cycling, travel, Union Canal on January 19, 2007 by smsm1986.